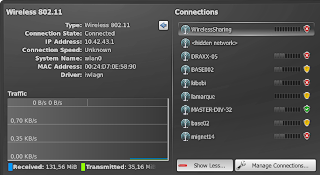 Tethering needs support from both Bluedevil and Plasma NM, and they must cooperate to a certain degree to register the connection in NetworkManager. After some research and some answers from the NetworkManager's guys we finally got the information we needed. Most of the needed code went to Plasma NM and Solid, the Bluedevil part was already almost done. System Name works for a serial (ppp) connection! :-) This was an old bug in Plasma NM, the usual NM method to get the interface name returns the serial device (/dev/ttyACM0, /dev/ttyUSB0, etc). The traffic graph also did not work for the same reason. I added a hack to force Plasma NM to always use ppp0 as interface name for all serial devices (Dial-up modem, Gsm/Cdma phones, Bluetooth). Well, now I do not need the hack because NM-0.8.2 can give me that information. Unfortunately the support for that is going to be available only in KDE SC 4.7.0. Cdma phones's bluetooth support (in both Solid and Plasma NM). PAN (bluetooth's Personal Area Network) support for both Gsm and Cdma phones. Those two is going to take time since my phone is not compatible with Cdma nor PAN. Update: PAN implemented for Gsm phones :-) Actually the service that the phone must support is NAP (Network Access Point) and not PAN. Or PAN always comes with NAP, I am not sure. Without the bluetooth patch to Solid's NetworkManager backend that is going to be in 4.7.0 Plasma NM will recognise bluetooth interfaces as gsm. The consequence is that Plasma NM mixes Gsm and Bluetooth connections but NM refuses to use pure Gsm connections with Bluetooth interfaces. With the patch in place Plasma NM can distinguish between Gsm and Bluetooth connections. 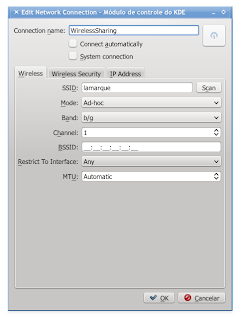 For instance, I have registered one Bluetooth and one Gsm connection in Plasma NM, but only the Bluetooth one is shown in the screenshots above. Update: Another consequence is that no gsm connection detail (operator's name, signal quality, access technology) is available without the Solid's patch. No, for now there is no way to use the same registered connection with the same phone connected through USB and Bluetooth. You have to create one connection to be used when the phone is connected through USB and another connection when the phone is connected through Bluetooth. When the bluetooth controller is active and there is a bluetooth connection registered the bluetooth interface is always shown, even when phone's bluetooth is disabled. That is the way NM works. Some lines of code in Bluedevil to call Plasma NM to register a bluetooth connection when a bluetooth device has just been paired. Recompile kdelibs and kde-workspace. Recompiling kdelibs is needed because of the ABI changes in Solid. I had some crashes in kded4 until I recompile kdelibs. Execute: $(kde4-config --path exe --locate networkmanagement_configshell) create --type bluetooth --specific-args "00:11:22:33:44:55 dun" . Pay attention to the quotes (") in "00:11:22:33:44:55 dun", they are required. Change 00:11:22:33:44:55 to your phone's bluetooth hardware address. You can get it in Bluedevil. Update: Change dun for nap if you want that service. In a few seconds Plasma NM's Mobile Connection Wizard window should appear and you can finish registering the connection. After that you can go the Plasma NM window and the connection should be there. Just click on it to connect to the Internet. You can edit/delete the bluetooth connection in Plasma NM even without the Solid's patch. Update: I am going to work more on nm09 branch from now on. The number of people complaining about poor NM-0.9 support is increasing. Unfortunately I am also very busy on other things now so I will have to slow down on Plasma NM bugfixing. 209673: Improve 802.1x certificate handling for WPA PEAP connections. 253362: Try to limit the auto-expanding width code used to accomodate the traffic plotter in interface details widget. 258246: dont't show hiddenWirelessNetworItem by default, show it only if showMore is checked or wireless interface details are activated. 257920: Enable setting of custom routes. 272140: Set timestamp for system connections. 272135: Hover all connections associated to a network interface instead of just the first one found. 272138: Fix problems when changing connection's scope from user to system and vice-versa. Be warned that changing connection's scope is not well tested yet. 272174: Disables connection's hover state when entering interface details tab. 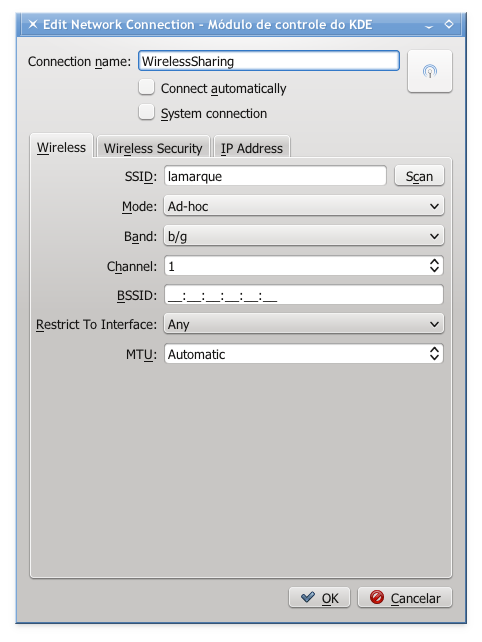 209624: Add Bluetooth Network Access Point (NAP) tethering support for Gsm phones. Thanks Rajeesh K. Nambiar for implementing the patch and testing it with his iPhone 3GS. 264083: Try to unlock (PIN/PUK) and enable modem before connecting to Gsm connections. Also PIN is now one-time only. 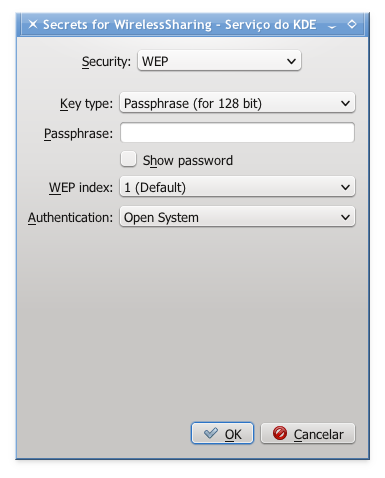 194899: Add button in wireless connection editor to copy the current access point's MAC address to BSSID field. 268021: Add notifications for VPN connections.
. 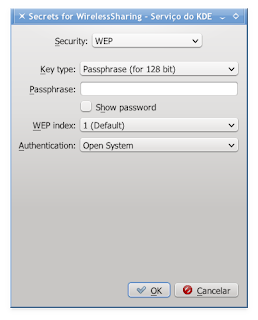 Uses KAuth (KDE's Policy Kit wrapper) to authorize users to create/delete/modify system connections.
. Load networkmanagement kded's module on plasmoid startup to make sure it is loaded. 271768: Show notification to warn user if he/she tries to connect when networking or wireless is disabled. 271767: Automatically show other connections in main window if there is no preferred network available. 271765: Add button to configure notifications directly from networkmanager settings. 253584: Avoid dangling pointer when deleting RemoteInterfaceConnection. 203584. Bluetooth tethering support for Dial-up Network (DUN), tested with my phone (Samsung i8910). CDMA will take more time since I do not have a compatible cell phone to do tests.
. Show essid and MAC address of the active accesspoint in wireless interface details. 249016: Enable additional addresses even on DHCP. 271353: Try harder not to resize the "show more" button. Also all connection widgets do not change its height when toggling "show more" button. We also have a proposal patch for adding IPv6 support to Plasma NM, which would close bug 270827. Well, not everybody have a real IPv6 network (no IPv4 tunneling, IPv6 DHCP server) available to test this patch, so if anybody with such network could test it the patch's author (Ilia Kats) and me would appreciate. Update: patch commited, now we need more real world testing. Update: last week I confirmed Ilia Kats' KDE developer account and now he is a Plasma NM developer, congratulations :-) That is the least I could do after all the important work he is doing for Plasma NM, such as the ad-hoc fix and IPv6 support among others. Click on the connection in Plasma NM window and wait. I was able to browse the web using my cell phone. 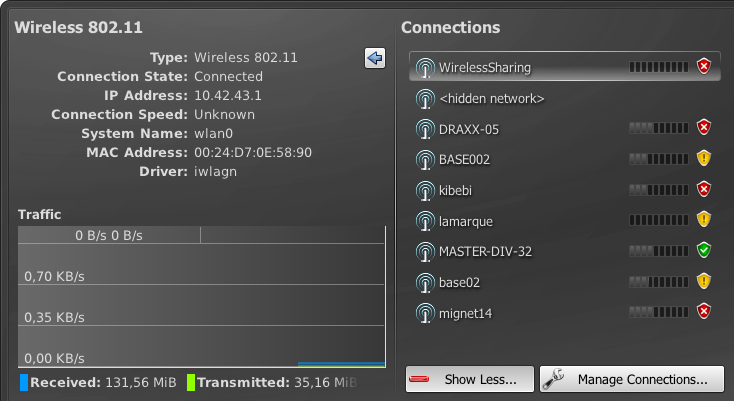 The WirelessSharing connection did not appear when I scanned the neighborhood, I had to write the essid manually. Using my current notebook as gateway I was able to connect my old notebook to the Internet too.